The most inspirational times in life usually sneak up on you and catch you off guard. And they have all the more impact on your life because of it. It was the mid-1970s and I was working as an orderly in a large Catholic hospital in suburban Cincinnati, Ohio. My duties were many and varied, but they included what many people would consider the least desirable tasks one could be required to perform. But I embraced the opportunity to use those tasks and skills to minister to people at their point of need, and seek to acquire the attitude of servanthood. These tasks, performed on the male patients, included (but were not limited to) administering enemas, inserting and maintaining urinary catheters, and “finishing baths,” which meant that when a female nurse was finished giving a man a sponge bath, I would come in and wash the area from belly button to thigh, alleviating anxiety on the part of the patient, and providing the opportunity to provide a little conversation and cheer. Rarely, and only when no male nurse was present, I would be called on to perform similar tasks in the Emergency Room. 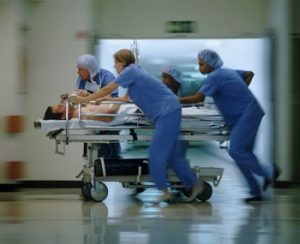 Emergency medicine is not an arena for the squeamish and faint of heart, and most hospital workers have to develop “professional calluses” on their emotions to keep from allowing sympathetic sentimentality to cloud their ability to perform the necessary duties objectively and skillfully. But occasionally a patient arrives in such overwhelmingly shockingly grisly condition that it is all the staff can do not to fall apart or gag. It is a battle just to focus on helping and not look away. Such was the case with Charlie. “ORDERLY STAT, ER!” The call rang through the speaker system throughout the hospital and I was the only orderly available. I ran immediately to ER, and nearly gagged at what I saw when I got to the little ER patient room. The man on the gurney was lying on his back. His pant legs had been ripped open and below the knees the pieces of bone, muscle, ligaments, tendons, and skin that had been his shins were placed in their approximate anatomical positions like pieces of a poorly crafted jigsaw puzzle, but looking more like a butcher’s trimmings. It was shocking, gut-wrenching, nauseating, and horrifying. It was all I could do to regain my composure after the initial shock. “Orderly, please insert a Foley catheter for this gentleman.” And that’s when I noticed the most shocking thing of all. HE WAS COMPLETELY CONSCIOUS! He was calmly looking right into my eyes. I saw no evidence of shock or grief. Just peace. “It’s pretty bad, isn’t it?” he asked me. “Yes,” I answered quietly. I explained to him what I was going to do. I installed the catheter, then touched his shoulder and looked into his eyes. “Thanks,” he said, putting his hand on mine. And he smiled. HE SMILED! Moments later, he was prepped for surgery and taken into the operating room, where he underwent a bilateral leg amputation – one just above the knee, and one just below. The next day I saw Charlie in his room on the orthopedic wing of the hospital when I went to finish his bath. He smiled warmly and said, “Hey, I remember you!” Over the next few minutes he told me the story of how he came to be in the Emergency Room. Charlie worked for Cincinnati Bell, the telephone company. He had pulled over to the shoulder of the road to rearrange some equipment in the back of his truck in preparation for his next job. While he was standing there, a car came careening behind him, out of control, and crashed into the back of his truck – with his legs in between. Even hard braking couldn’t lessen the impact significantly. The ambulance responded promptly, and in just minutes, the paramedics had picked up the pieces of his legs as best they could and rushed him to ER. Thankfully, they were able to put tourniquets on both legs, which kept him from bleeding out, saving his life. Charlie spoke in glowing terms about the ambulance crew, the ER staff, the nurses, the surgeon, and the hospital staff. He was so grateful to everyone and so happy to be alive. Not a single complaint or criticism – even of the driver of the car that struck him. Day after day when I came to finish Charlie’s bath, and later, to wheel him into the shower, I was greeted with that same cheery attitude, and a complete absence of bitterness, anger, resentfulness, or despondency. He was upbeat, had a great sense of humor, and was appreciative of even the smallest gesture of assistance on his behalf. Charlie’s legs healed nicely, and he was fitted with prosthetic legs. I watched as day after day I would pass him in the hallway, getting used to his new legs, and determined to get every scrap of life back. After about six weeks in the hospital, he walked out to return home. Charlie visited the ortho nurses’ station from time to time, and I was lucky enough to see him and visit with him. You absolutely could not tell that he was not walking on his own legs. He said that most days he forgot that they were prosthetics, it was all so natural to him now. I thought a lot about Charlie. I still do from time to time. His upbeat attitude, his sense of humor, his optimism, and his determination were astonishing to me. They still are. When I’m tempted to complain about my aches and pains, a difficult situation, life’s little inconveniences, or any of a hundred other things, I think about Charlie. Just an ordinary cheerful telephone worker who refused to let a catastrophic loss ruin his life – or even slow him down. My trivial little annoyances don’t even seem worth mentioning. he calls them “light and momentary troubles” in the light of eternity. That’s the place I want to get to. That’s the perspective I’m running towards. That’s the faith and optimism I want driving my life. To get to the place where I see life’s pains, discomforts, inconveniences, and pressures as “light and momentary troubles” in light of the resplendent glory of knowing Jesus for all eternity. To meet life’s challenges like Charlie, like Paul, like Jesus. That’s the best thing I have read in a long time – and usually I don’t read things this long due to time constraints. So, thank you, Randy. I appreciate this new inspiration too! Thanks for the kind words, Patti.